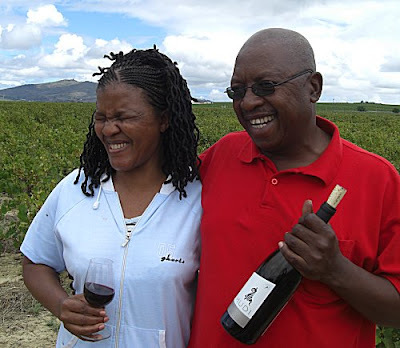 When I wrote last year (see here) about M’hudi wines and my chat with Oupa Rangaka, I mentioned that Oupa was being filmed by a television company. Now the results are due to be shown on BBC-tv's digital channel BBC 4 in March in a three part series features different aspects of the wine business including London wine merchants Berry Bros and Rudd and Chateau Margaux. The final programme, titled 'The Future', to be shown in March, travels to South Africa to talk to Oupa at M’Hudi and Mark Solms of Franschhoek winery Solm’s Delta . "You’ll be reading a fair bit about Pinot varieties over the next few weeks, as we get closer to wine fest time. 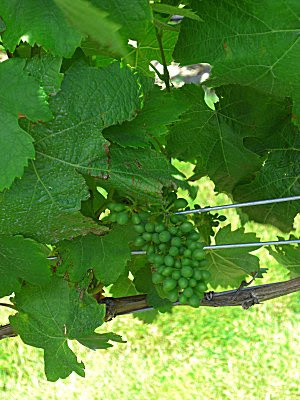 First off the bat,Pinotage, a red wine grape originally bred in South Africa, where it is the signature variety. Here in B.C., Inniskillin’s Discovery Series includes a slightly spicy Pinotage that boasts a heavy palate of red fruit, with a nose of cherry, raspberry and prune. A few layers of toasted vanilla lead the nose to a nice finish. Match with rich pastas, braised meats or savoury stews. 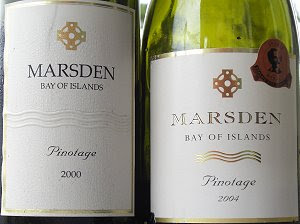 The Pinotage Club has been active on the web since 1997, and it comes near the top of any Google for Pinotage, so it was rather surprising to read in wine-writer Eric Asimov's New York Times of 20 January 2009 that I’ve yet to find a hard-core pinotage fan club. Eric Asimov has just discovered South African wines and he's impressed with the Cabernet Sauvignons, but he thinks that increasingly its producers are focusing on cabernet sauvignon. Err?? Surely red-wise the new focus is Shiraz? Eric says of the South African wines that their track record is slim. We don’t know yet how these wines will age, thus dismissing 350 years of continuous wine production. Since he gets so much so wrong, how much reliance can be placed on his opinion of Pinotage as a distinctive wine that is made virtually nowhere else in the world, but almost nobody likes or wants that wine? Wither Hills, in Marlborough’s Wairau Valley, is the answer to ‘guess who is growing this Pinotage’. But they are not making any Pinotage wine. A short row of Pinotage is one of an exhibition at the entrance to Wither Hills intended to demonstrate to vistitors most of the varieties being grown in New Zealand. It was instructive to me to see how much smaller the berries were than those I had seen just a week before on the North Island. Grape vine flowering here can be a week or more later than in the North. Today I leave New Zealand from Christchurch on the South Island to fly to Melbourne, Australia to see relatives before heading home via Singapore. New Zealand has been really enjoyable, the wine is all of excellent quality and my only regret is that they do not make more of Pinotage. I'd like to thank Sue Courtney of www.wineoftheweek.com for her lovely welcome to New Zealand and all the assistance she has given during my stay in her wonderful country. P’06 is medium dark ruby red with a subdued nose and restrained fruit. It’s a bit flat in the mid-palate but finishes well with mulberries and tangy spices. The tannins are soft and there are no rough edges. The wine is already throwing some sediment. Overall it is a well made red wine in a Bordeaux style, ideal with dinner. Here’s a rare one; an eight year old Pinotage from Marsden Estate in KeriKeri in the Bay of Islands near the top of North Island. The winery is named after Reverend Samuel Marsden who planted New Zealand’s first vineyard by the coast in the Bay of Islands. The back label suggests this wine will cellar from two to five years and we’re already three years past that date. The wine is pale red turning to brick and it doesn’t have too much bouquet. There are sweet fruit flavours, although they’re fading and the wine has all the characteristics of smooth aged claret. Pleasant, but it is time to drink up. Here we’re in the recommended cellaring range and indeed this wine appears to have a lot of life left in it. The colour is dark garnet with a red rim. It is rather classy; nice fruit balanced by gentle tannins with some dusty blueberries flavours and a creamy finish. This is a very drinkable and enjoyable wine. Many thanks to Ben Dugdale for arranging the opportunity for me to drink these wines. Guess Who is Growing this Pinotage. My question is -- which winery is growing this Pinotage? Some clues. I have been in New Zealand for the past month or more and this picture was taken on 31 December 2008 in the grounds of a major New Zealand winery which is famous, especially in Britain which is a major importer, for Sauvignon Blanc wines. If you know anything about NZ wine you’ll recognise the winery name; we’re not talking about some garagiste winery you’ve never heard of. 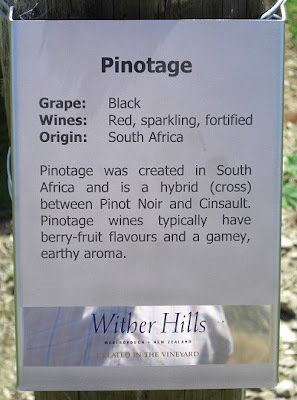 But the winery does not list a Pinotage varietal among its wines, so you’ll find no help on winery websites. The size of the grapes in the picture may give you a clue as to whether we are on the North or South Island, and that in turn may indicate the region. It’s a near impossible question, so don’t hold back – have a guess and have a go!